Six out of every 1,000 babies are born with an atrial septal defect (ASD). ASD can cause respiratory distress for newborns, and this difficulty breathing can impair their ability to breath and be fed — leading to malnourishment, irreversible lung circulation damage, other complications and eventually death. It is very important to recognize this pathology and treat it before it is too late. 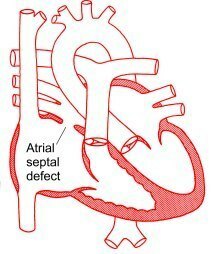 What is an Atrial Septal Defect? An atrial septal defect is a hole in the heart wall that typically separates the right side of the heart from the left. This hole will cause issues involving blood flow through the heart and body. Think of the heart as a system of two separate pumps, right and left. The right side receives blood from the body and then pumps it into the lungs to re-oxygenate it. The left side receives the oxygenated blood from the lungs and then pumps it to the rest of the body. The ASD causes a portion of the oxygenated blood to flow back to the right side instead of going to the rest of the body. This situation will force the right side to work harder than the left and could also cause “flooding” of the lungs and respiratory distress because of excessive blood flow. Learn more about the Atrial Septal Defect (ASD) from the CDC. When the atrial septal defect is large and causes severe symptoms, a spontaneous closure is unlikely. Minimally invasive Atrial Septal Defect (ASD) repairs can be performed to restore the normal anatomy permanently without leaving foreign bodies within the heart (as is the case with catheter therapy). This type of ASD repair can be performed through a tiny 2″ incision on the chest wall. Dr. Ciuffo closes the ASD with a suture line or a patch of the patient’s own tissue. Minimally invasive patients have the advantages of being left with only a very small scar, significantly less pain, and a quick recovery compared to other methods. For newborns with a small atrial septal defect, showing no heart failure symptoms and responding well to medical therapy, a pediatric cardiologist will typically observe the patient and wait for the Atrial Septal Defect to close spontaneously before operating. Small ASDs tend to close spontaneously and present very light symptoms. In this case, the baby will have regular physical examinations and echocardiograms in order to monitor. In some small ASD cases, ASD is diagnosed much later in life. Adult patients are diagnosed typically because of the onset of new symptoms or finding a heart murmur during a routine exam. In some cases, the ASD can be closed with a catheter intervention. A thin, long catheter (tube) is inserted through the groin and positioned in the heart across the ASD. The catheter will then deploy and anchor a special mechanical patch, known as the “clamshell” device. The device consists of two wire and silicone disks that are deployed to “sandwich” the atrial septal defect closed. If you, your baby, or someone you know is suffering from an Atrial Septal Defect and aren’t sure which route to take, contact us for more information. Dr. Ciuffo will be able to discuss your options and an open and friendly environment. Get in touch before it’s too late — call us at (330) 363-1341 or contact us online. You can also read more in depth information and see images of our minimally invasive Atrial Septal Defect (ASD) repair treatments.